Last year, the Chevrolet Equinox was Chevy’s second-best-selling nameplate after the Silverado. For 2018, the Chevrolet Equinox has been completely redesigned with the latest design cues, technology, comfort, and safety on the market, making the new Equinox an all-around appealing vehicle to a broad audience. Some notable upgrades to the 2018 Chevy Equinox include a more lightweight build with a lower center of gravity for better fuel economy and performance, a standard turbocharged engine, the option of a turbo-diesel engine coming soon, advanced safety equipment, and plenty of space to stretch in the cabin. The 2018 Chevy Equinox comes standard with a 1.5-liter turbo engine. Drivers can also choose an available 2.0-liter engine that’s more powerful and mated to an upgraded nine-speed transmission, providing a sportier driving experience and smoother shifting. Lastly, the new Equinox has a 1.6-liter turbo-diesel option, the most fuel-efficient of the bunch. •The available 2.0-liter engine, paired with a nine-speed automatic transmission, lays down 252 horsepower and 260 lb-ft of torque and is capable of towing up to 3,500 lbs. The Tow/Haul button makes it easy to tow heavy loads. The interior of the Equinox features the latest Chevrolet MyLink infotainment system along with the option of a 4G LTE Wi-Fi hotspot onboard. The vehicle also has Apple CarPlay and Android Auto software for optimum connectivity on the go. There’s plenty of space for passengers and versatile seating in case you need to fold down the rear row for extra cargo space – 63.5 cubic feet maximum. The myChevrolet mobile app lets you control your Equinox remotely, such as starting or stopping it and locking or unlocking the car doors. Another convenient technology is the available hands-free gesture liftgate. 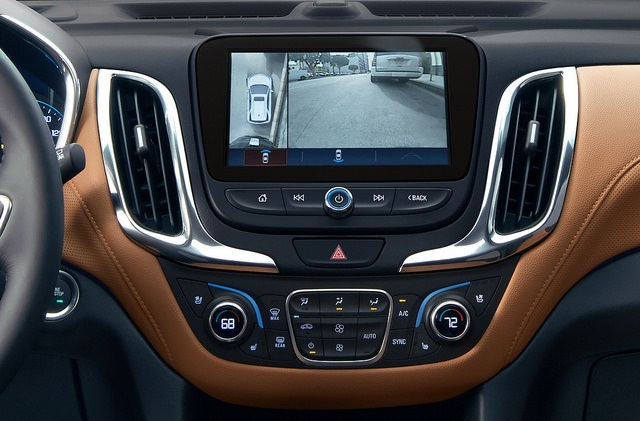 Safety features for the new Chevy Equinox abound. 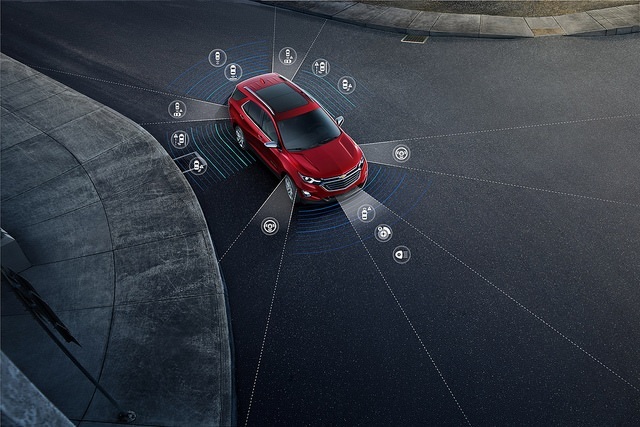 Outside the traditional safety features, such as a full suite of air bags, the Equinox offers Teen Driver standard and makes available a number of driver-assistive features, including Low Speed Forward Automatic Braking, Lane Keep Assist with Lane Departure Warning, Forward Collision Alert, Rear Vision Camera, Rear Cross Traffic Alert, Rear Park Assist, Side Blind Zone Alert, Lane Change Alert, Intellibeam headlamps, safety alert seat, and surround vision. 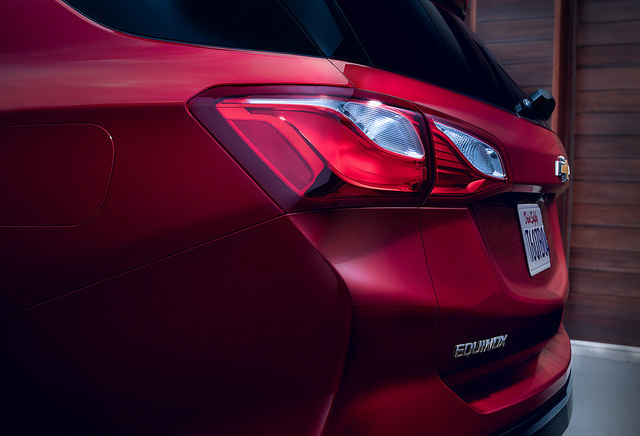 The Equinox is sporty yet elegant, with signature LED daytime running lamps heading up the redesigned and sculpted exterior. Exterior colors include Nightfall Gray Metallic, Sandy Ridge Metallic, Storm Blue Metallic, Ivy Metallic, and Orange Burst Metallic, among others. If you’re interested in the all-new 2018 Chevy Equinox, stop by Landmark Chevrolet in Randolph NY today for more information!